Treadmills were among the first indoor cardio machines, and remain enduringly popular to this day. One reason treadmills have remained so popular is their versatility. People use treadmills to put in the long miles needed for a marathon, for the speed work required to improve their 5K times, or simply to stroll on a regular basis to keep in shape. The beauty of treadmills is that you can perform the simplest of movements – walking or running – in the comfort of your own home, no matter what the weather. 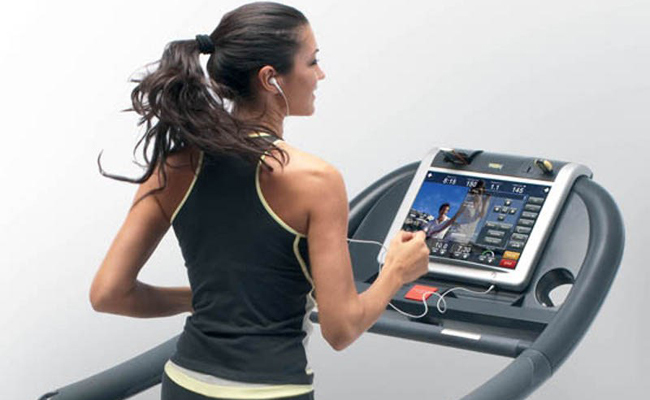 If you are shopping for a treadmill, the first considerations are likely to be space and budget. There is not much we can do to help you with your budget, but if you choose the right model, you can get around the space issue to a certain extent. How? Folding treadmills. Folding treadmills are a brilliant idea – quite simply, when the machine is not in use, it folds in two, stands upright, and rolls along on a set of wheels. This means you can stow it away in a cupboard, rather than having it stuck in the middle of the room the whole time. This is an important issue – you need to have a good idea of how fast you are going to run. Most machines have a range of between 0-16kph (0-10mph), with some going up to 19kph (12mph). While most people walk at around 4.5-9kph (3-6mph) and run at 9-16kph (6-10mph), it’s best to check what speed you run or walk at before you buy a machine. The bottom line about running beds is that more expensive machines typically have better cushioned running beds. This is less important if you are just going to be walking, but for runners – especially those covering a lot of miles – the cushioning is important. The other issue is length of the bed. They range from 40cm-56cm (16”-22”) wide and 1.1m-1.7m (45”-66”) long. Make sure you get one big enough for you – long legged runners will need a longer bed, for example. While there are budget machines with no motor – you need to run to get them going and keep them going – most models have a motor. They usually have one motor to drive the belt and another to control the incline. As with cars, the larger the motor in an electric treadmill, the more horsepower it can deliver. How much you need depends on your speed and your body weight, but in general, for walking and easy jogging, look for a horsepower rating of 1.0hp-1.5hp, while for running, choose a minimum of 1.5hp. Heavier runners will need a minimum of 2.0hp. the other essential feature is an adjustable incline. This allows you to vary the resistance, essential if you are training for races. Look for an adjustable, motorized incline that can go up to at least 15%. If you choose carefully, this popular machine will give you years of great workouts.